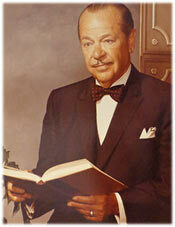 W. Clement Stone, a successful, self-made business man and philanthropist befriended Napoleon Hill many decades ago. Stone was a firm believer in PMA (Positive Mental Attitude) and a dedicated practitioner of the principles of Think and Grow Rich. Following Stone’s ascent into the high stakes game of insurance sales, he eventually became chair of the Napoleon Hill Foundation, and continued to provide direction to the organization for nearly a decaded. Because of Stone’s long term involvement with the Foundation and his substantial support of perpetuating the success philosophies of Napoleon Hill, we are pleased to share details of his career. “All I want to do is change the world,” he said. The founder of Combined Insurance Co., who through his private foundation passed along $275 million-especially for education and childhood development-since 1958, died Tuesday September 4, 2002 of pneumonia at Evanston Hospital. He was a resident of the North Shore suburb. He celebrated his 100th birthday in May with a gift of $100,000 to the University of Illinois at Chicago. Famous for his pencil-thin black mustache, his polka-dot bow ties and a solid fix on motivation as the engine of success, Mr. Stone identified so strongly with PMA-positive mental attitude-that it was the ticker symbol for his holding company, Combined International Corp., when shareholders formed it in 1980. Combined Insurance merged in 1982 with Ryan Insurance, and in 1987 the name changed to Aon Corp. Last year, it reported total revenue of more than $2.035 billion. He wrote books-most famously, with Napoleon Hill, Success Through a Positive Mental Attitude, published in 1960. His own rags-to-riches tale started May 4, 1902, in Chicago, where he was born to Louis and Anna Gunn Stone. His father, Louis, a clothing manufacturer, died when he was 3. His mother found work as a dressmaker, while the boy, at 6, was on the streets, hawking the Examiner newspaper to help pay the rent. At 13, he had his own newsstand at 31st and Cottage Grove. At the age of 16, he joined his mother in Detroit, where she ran an insurance agency. By 20, he had his own agency in Chicago and by 1930 had rounded up 1,000 agents. As a teen, Mr. Stone dropped out of Senn high, but eventually completed a diploma at YMCA night classes. Before leaving Senn, he met Jessie Verna Tarson. They married in 1923 when he was 21 and went on to rear three children. He always said she was part of his secret. He contended that he lived so long “because I was married to the most beautiful girl in the world, and dancing every chance I could,” friends remember him saying. Even the Depression didn’t get Mr. Stone down. He was quoted in the New York Times saying it forced good work habits. He read and then embodied the Horatio Alger books, many of which were shelved at Combined’s office at 5050 N. Broadway. A generous backer of Republicans, he contributed to Richard M. Nixon-with whom he bonded because of interest in the Boys Clubs-and was named a trustee of the Nixon Foundation. He was nominated for the Nobel Peace Prize in 1980 for his philosophy and his philanthropy, including the W. Clement and Jessie V. Stone Foundation. Survivors include his wife; a son, Norman, 12 grandchildren and 13 great-grandchildren.